Plants for Health | Plants  Perfect Partners? Our environment has changed dramatically in recent years, whereas we genetically have not. People spend a lot of time indoors at home or work, or in traffic away from green spaces. Air conditioning, improved insulation, and energy-saving measures all reduce air exchange, which can lead to health problems. We are breathing the same air over and over; but in cities and on busy roads, we are unlikely to want to bring 'fresh air' inside anyway. 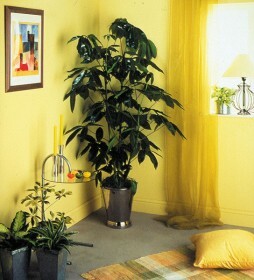 In addition, modern synthetic furnishings, computers and electrical equipment, and everyday household products such as cleaning material, emit various harmful gases in small quantities which all contribute to the recognised "sick building syndrome"
The simple addition of a few houseplants in your home or office can do a great deal to boost your health and well-being. Plants live in harmony with humans - we give plants carbon dioxide when we breathe out, and they give us oxygen through transpiration. Indoor plants boost oxygen levels and reduce air temperatures, as well as raising humidity, making it easier to breathe. Whether in the home or workplace, placing a plant nearby will improve air quality, reduce temperatures and make people feel happier.